I woke up today knowing that the forecast was calling for rain, and I thought I would wait to see what kind of rain developed before deciding what I would do today. It did start to rain pretty early, but it was very light–hardly anything–so I started out, keeping my options open. My first stop was Nijo-jo, the shogun castle built in 1603 as the official residence of Tokugawa Ieyasu, and the place where the last Tokugawa shogun, Yoshinobu, surrendered to the newly restored Emperor Meiji. How about a quick Japanese history lesson? 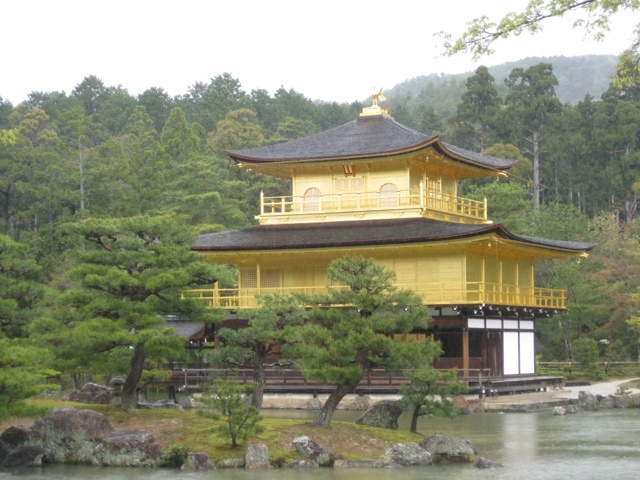 Buddhism was introduced into Japan in the 6th Century CE, coming via Korea and China. It became a major influence in Japan under Prince Shotoku, who ruled from roughly 592 to 621 CE. However, it was intentionally linked with Shinto–and also Confucian morality and ethics–into one government-supported system. 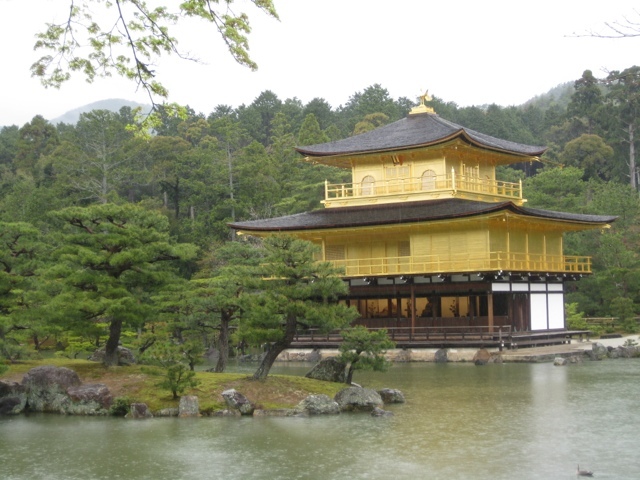 The Nara period [710-794] was a high point of Japanese Buddhism: the city of Nara was founded and showcased palaces, temples and parks. 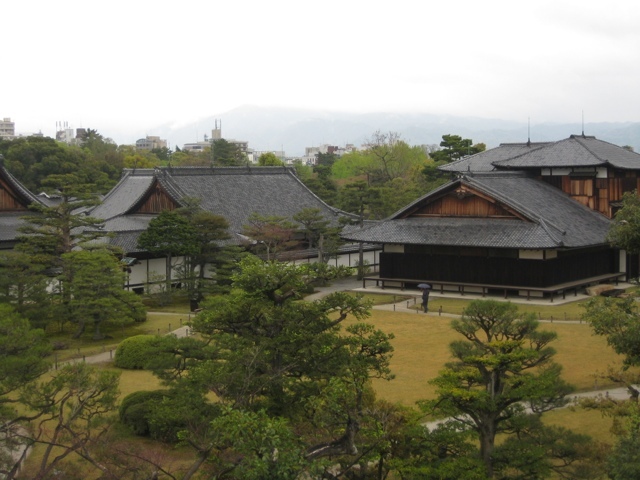 After the Nara period, the capital was moved to Kyoto and the Heian period began, which lasted until 1185. [One of my reference books calls this the “golden age of imperial court society.”] It was during this time that Kukai founded Shingon Buddhism and Saicho founded the Tendai school. 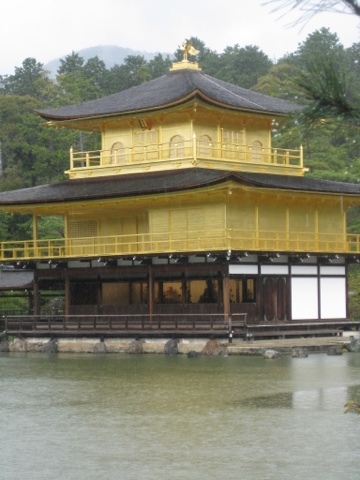 Still at this time Shinto was harmonized with Buddhism. After the Heian period came the age of the samurai, ushered in by the Gempei War. Minamoto Yoritomo finally prevailed, but was unwilling to make himself emperor, given the belief that the emperor had divine status. Instead, he had the emperor make him “shogun” [which translates roughly as “commander-in-chief”] with the power to rule in the emperor’s name. He also left the emperor in Kyoto, and moved his government to Kamakura, near what is now Tokyo Bay. The shogunate lasted almost 700 years, until 1868. It was during this Kamakura period [specifically in the 12th & 13th centuries] that three other very important schools of Buddhism developed in Japan: Pure Land [Jodo-shu & Jodo-shinshu, founded by Honen and Shinran, respectively], Nichiren, and Zen [both Rinzai and Soto schools, founded by Eisai and Dogen, respectively]. 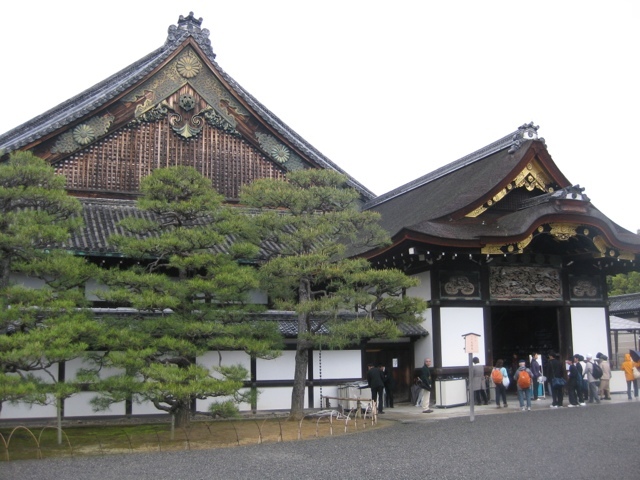 The last shogun government was the Tokugawa house, established by Tokugawa Ieyasu [mentioned above–he ruled from 1543-1616]. 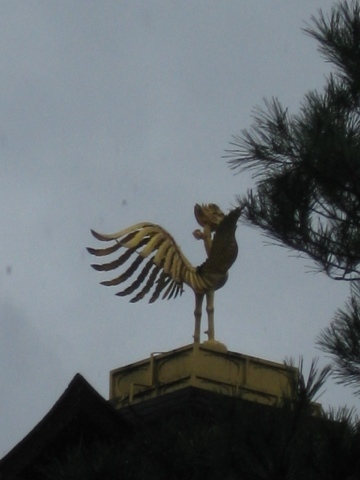 This government ruled for roughly 250 years: it drove Christianity out of the country and severely persecuted any Christians who refused to recant; it mandated that each family have membership in a Buddhist temple, and the temples themselves were organized and placed under central authority–even as Shinto also was reviving. The Tokugawa shogunate began to decline, however, and finally, in 1866 & 1867 both the last Tokugawa shogun and the emperor died unexpectedly, and a new emperor, Meiji, took the throne. Radical imperialists seized this moment to restore imperial rule and dissolve the shogunate. This ushered in the Meiji era, which lasted until the end of WWII in 1945. In an edict promulgated in 1868, the Meiji government promoted Shinto as the national religion of Japan, linking the government with Shintoism as one single entity. This served to abruptly and decisively sever Shinto from Buddhism–the symbols/images from one were not to be found in the houses of worship of the other; and families now were required to be members of a Shinto shrine, not a Buddhist temple. 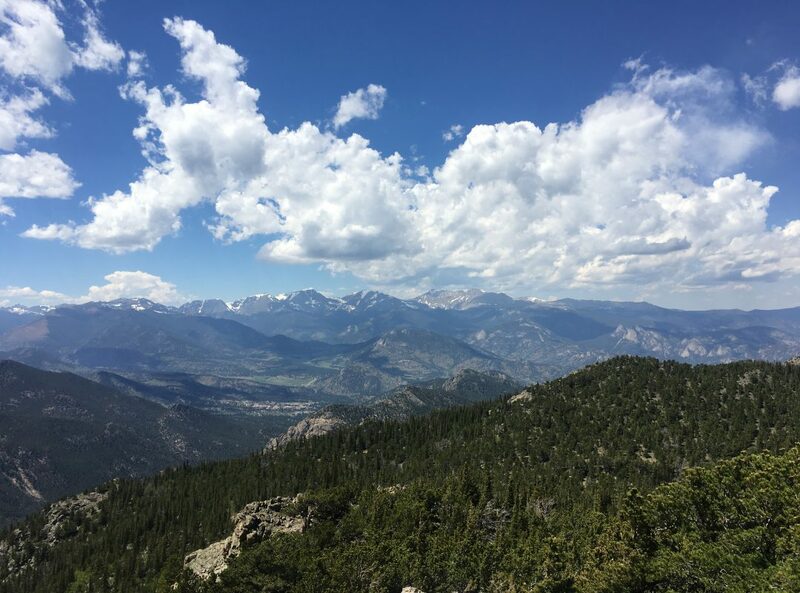 However, Buddhism still thrived: priests were now able to marry, and Japanese Buddhism as a whole became more international–both receiving and sending scholars/missionaries/priests to and from different parts of Asia and the United States. [Buddhism came to the United States right around 1900.] Christianity also came back to Japan after being prohibited as a religion there until 1873. It never really has taken hold here however, and the number of Christians hovers right around 1 million, in a country with roughly 127 million total people. OK–lesson over! Back to the castle! For me, the best part of the castle wasn’t the grounds–even though they were lovely. My favorite part was the interior of the Ninomaru palace: the rooms were decorated with elaborate, intricate wall paintings–all done by prominent members of the Kano School. [No pictures, allowed, sadly] My favorite was the room where the weapons were stored: there were several pictures of enormous hawks in that room–in contrast to the other rooms, where there were cranes, peacocks, etc., but no raptors. You could also see the concealed chambers where the bodyguards would hide and spring out if need be. The other thing that was really neat was what is called the “nightingale floors.” To ensure that no one could sneak in, the floors were built in such a way that when someone walks on them, they squeak, but in such a way that they actually do sound more like crickets or birds chirping, especially when lots of us were walking through the halls. 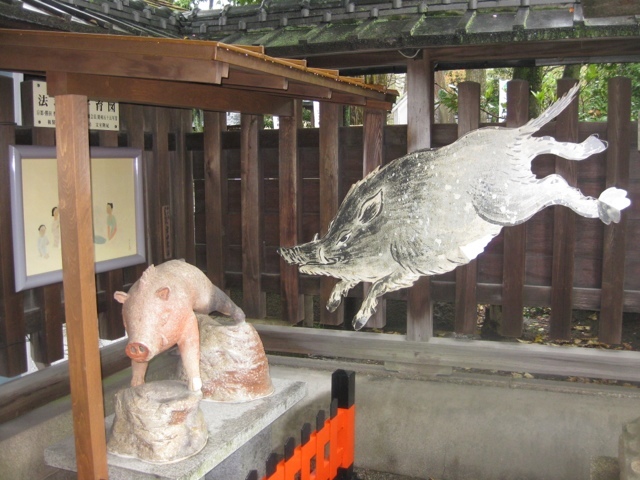 What I have found I much prefer is coming across the unexpected shrine that suddenly appears in my path–again, there are so many shrines in Kyoto that no one guidebook could possibly describe them all. One of the ones I found today on my way home [after the rain abated again–it figures!] 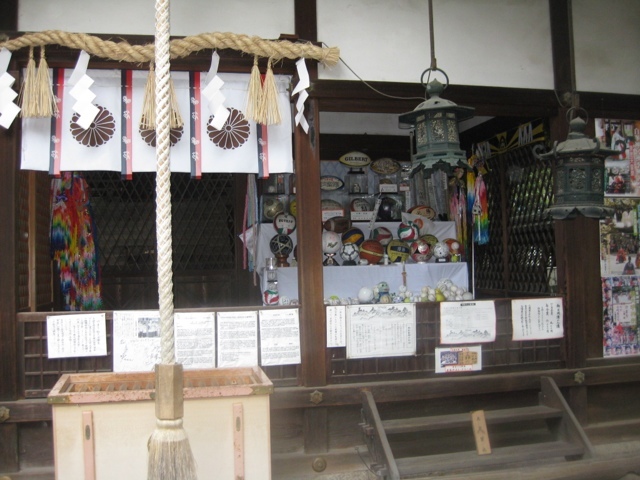 was the Goou Jinja, a shrine that houses the remains of two historical figures now worshipped as deities: Lord Wake no Kiyomaro and his sister, Princess Wake no Hiromushi. Honestly, from the translated page available at the shrine I couldn’t quite make out the story–something about them protecting the imperial lineage back in the 8th century when a traitorous Buddhist priest wanted to succeed to the throne. 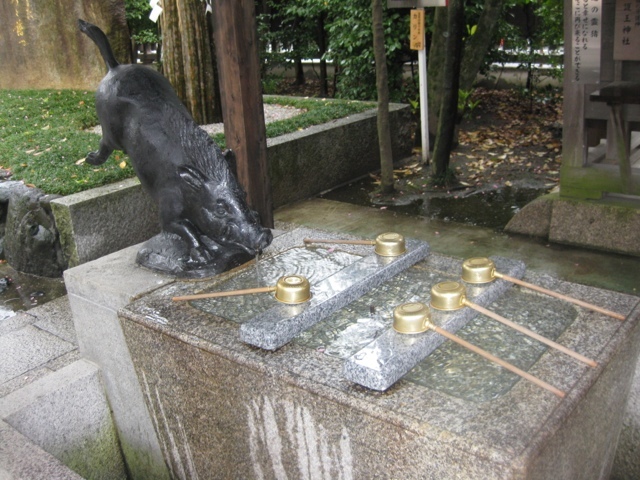 What was so interesting about this shrine, though, was the fact that wherever you might expect to see a “Komainu” [the carved dogs that typically stand guard at a shrine], there was a boar. 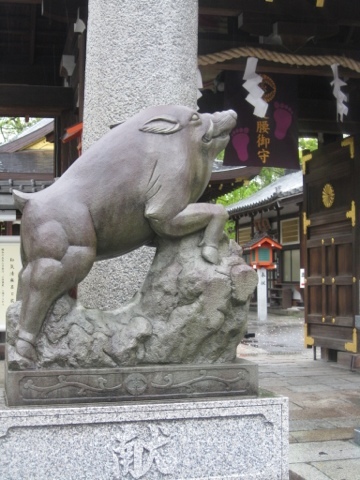 In fact, the place was full of statues of boars–and this is because after Wake no Kiyomaro was exiled, 300 wild boars escorted him to safety, and a serious injury in his leg was at the time miraculously healed. So, people continue to come to this shrine to pray for safe journeys and for healing in one’s legs and feet. 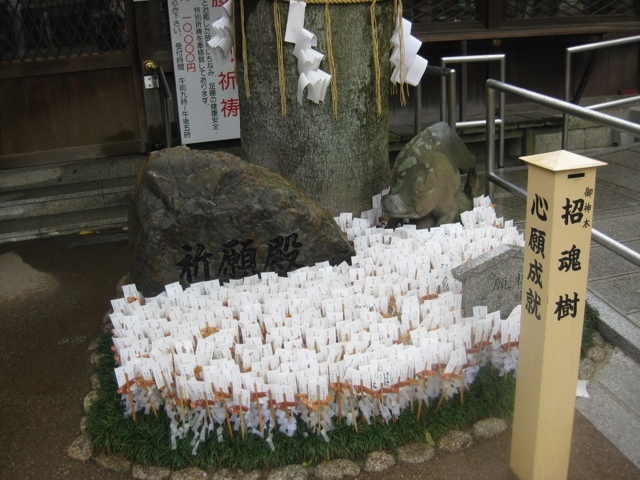 However, my favorite shrine was the Shiramine-jingu shrine, which stands on the site of the residence of the Asukai clan. 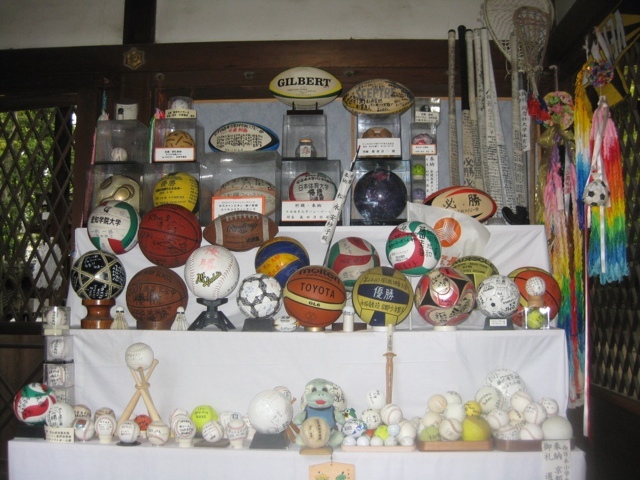 They are credited with creating some kind of ancient soccer game, and the guardian deity of this clan is still today revered by lovers of sports. You can see that in the pictures, right? 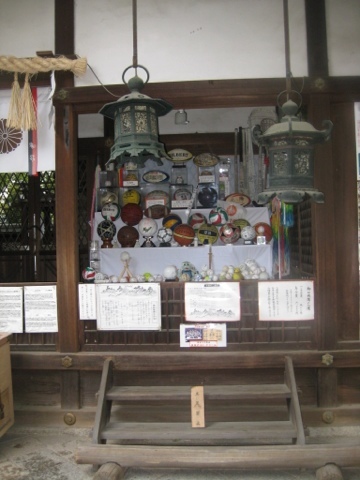 The only other people I saw at this shrine were a couple groups of schoolboys–sports fans and/or players, no doubt! Previous: Previous post: And Now for Something Really Different!